Just when we thought we'd unearthed all the quirky coffee shops in the city, one more pops up. 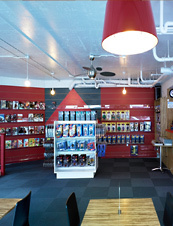 And when we say quirky, we mean a side of superhero comics and action figures with your hand-pulled espresso. Welcome to Caffeinated Comics, San Francisco's first comic book store/coffee shop (that's also on the verge of being a certified green business), open now in the Mission. Walking into Caffeinated is like stepping into the pages of Wolverine or Superman, only with a strong waft of java—there are big, bright-red, orange and yellow walls, and shelves stacked with the latest comics from Marvel, DC and a few indies. The bamboo-topped tables along the windows are the best for setting up your laptop—or paging through a few issues of X-Men—before ordering your coffee. Expect the usual menu of lattes and Americanos, but what makes it all so good is that they serve local Four Barrel beans pulled expertly on the La Marzocco espresso machine (the Ferrari of the espresso world). Try the espresso-spiked Depth Charge coffee or the Affogato (Mitchell's ice cream and a shot of espresso) from the Superhero Bar and add an old-fashioned donut. Or as we like to call it: the breakfast of champions.